Johnny Nichols is a true hero. By Bryanna Cappadona·	 1/16/2015, 11:56 a.m.
It’s just two days before the AFC Championship, and Pats fan Johnny Nichols has the right idea. 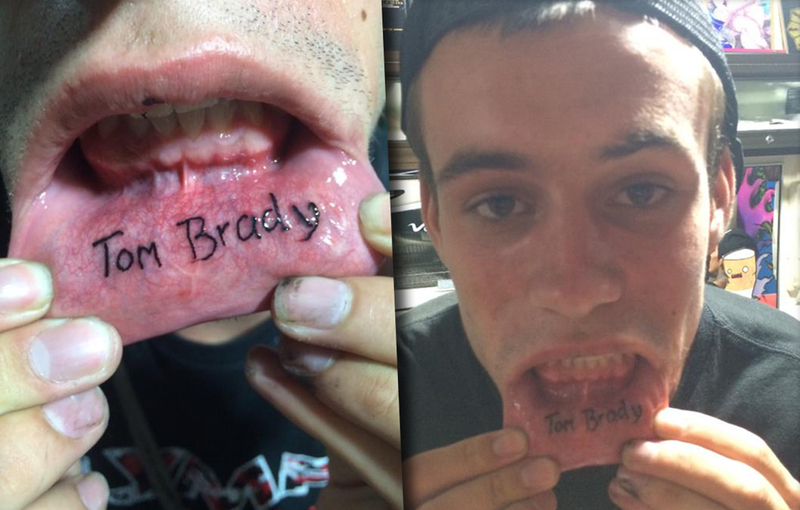 The 21-year-old from Waltham got “Tom Brady” tattooed on the inside of his lip to support the Pats this weekend. And the best part is that he got the tattoo in Bali, Indonesia. Whaaaat. “Have to represent from 9,000 miles away!” he told us. Nichols has been traveling for the past few months, traveling to Thailand before going to Bali. “I’m really into surfing,” he said, and also admits he wanted to miss out on the cold weather. Again, this guy has the right idea. “You ever wake up one morning after a crazy night and just realize you have Tom Brady tattooed on your lip?…I did…LETS GO PATS!” he wrote on his Facebook page. The Patriots will face the Colts on Sunday at Gillette for the AFC Championship game. Kickoff is at 6:40 p.m. No word on how Nichols is going to tune in from across the globe. Stay tuned.